Mother’s Day plans got me thinking about some of the so-called “liberating” trends for women. Unfortunately, although canned vegetables did save work and time, they weren’t very tasty. They were also mushy and salty and lacked the nutritional value of fresh produce. It doesn’t take much time to clean and cook fresh asparagus. Just a matter of rinsing them and cutting off the woody bottom, then either steaming, poaching, grilling or roasting them for a few minutes. In fact asparagus is one of the quickest and easiest vegetables to cook. We eat them regularly, sprinkled with a little lemon juice. Preheat the oven to 350 degrees. Place the almonds on a cookie sheet and bake them for 10-12 minutes or until lightly toasted. Remove from the oven and let cool. While the nuts are baking, wash the asparagus and cut off the tough, woody ends. 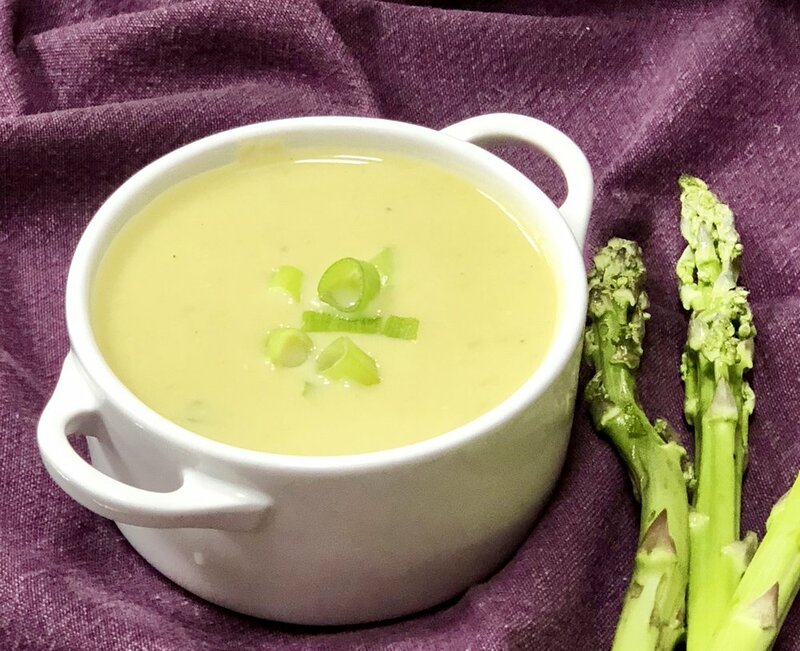 Place the asparagus in a skillet, add one cup of water, cover the pan, bring the water to a boil and cook over high heat for 4-6 minutes or until tender, but still crispy. Drain under cold water, wipe dry and place on a serving platter. In a bowl, combine the olive oil, vinegar, shallot, mint and dill. Mix well and pour the dressing over the asparagus. Add the nuts and cheese and toss the ingredients to coat the asparagus completely. Sprinkle with salt and pepper. When you can go into a supermarket any day, any time of year and find practically everything you need or desire — like peaches in December or apples in June — it’s easy to forget that there’s such a thing as seasonal food. Yes, there are a few foods that still invite yearning, as you wait for them to be ready at a precise time. You can’t force shad to spawn whenever you want them to, so shad lovers like me have to wait to buy the fish around May or June. And I have yet to see a pumpkin for sale in July. But even for the stuff you can buy whenever, there is an actual season where it is available locally. And that seasonal, local food is infinitely better. A tasty break from the transported foods from afar. Locally grown asparagus is just about beginning its season in many parts of the U.S. So if you like asparagus, now is the time to buy and savor it. Local, seasonal asparagus is like no other. The spears are more tender and delicate tasting than the others. Also, it’s Earth Day. If it’s sunny out where you are and you have a grill, celebrate the call for eating local products when you can by grilling a bunch of asparagus. Or use a grill pan or an oven broiler. No matter. Here’s a recipe for Grilled Asparagus with Ponzu Sauce. It’s an easy recipe and you can skip the Ponzu Sauce if you like, because plain old grilled asparagus is fine too. You can save leftover Ponzu Sauce in the fridge for a few weeks. Spring has sprung which means asparagus is in season. And of course, it is. From somewhere. But there are two kinds that aren’t. First, the kind you can buy from local farms and farmer’s markets. And two, white asparagus. Elegant-looking, white asparagus. It has a limited season. Like now. I had a friend once, she has since passed away, and was quite a bit older than me (in fact, she was older than my parents). Her name was Ro Dekker and she was one remarkable woman. She and her Dutch-Jewish family escaped the Nazis in 1939 on the last ship that sailed to New York from Holland. There is so much more I could say about her. But I will simply relate this little story and maybe some other time tell you more about her. Ro, who made dinner for us even when she was over 90 years old, told me that when she first came to this country she bought a bunch of green asparagus and purposely chose the spears that had large, white bottoms, which she cut off and cooked, thinking that this part was the edible part, like the white asparagus she had always cooked for her meals back home in Europe. She was upset that so much of the asparagus was green, and had to be discarded. Of course she discovered that the white part was not at all like the white asparagus she was used to. And for the rest of her life she knew to buy all-green asparagus or at least to cut off and throw away that woody, inedible white part of green asparagus. She also learned that for a few precious weeks a year she could get European white asparagus. Elegant, delicate white asparagus. And so she did. Folks, white asparagus is very expensive. It’s a treat. An occasional treat for most of us. So treat it right. Susur Lee, a chef with restaurants in New York, Toronto and Singapore says that white asparagus is his favorite ingredient because it is so gloriously sweet and tender. He says that treating it right means: peel the skin, which can be chewy, and don’t overcook. You can read the article here. 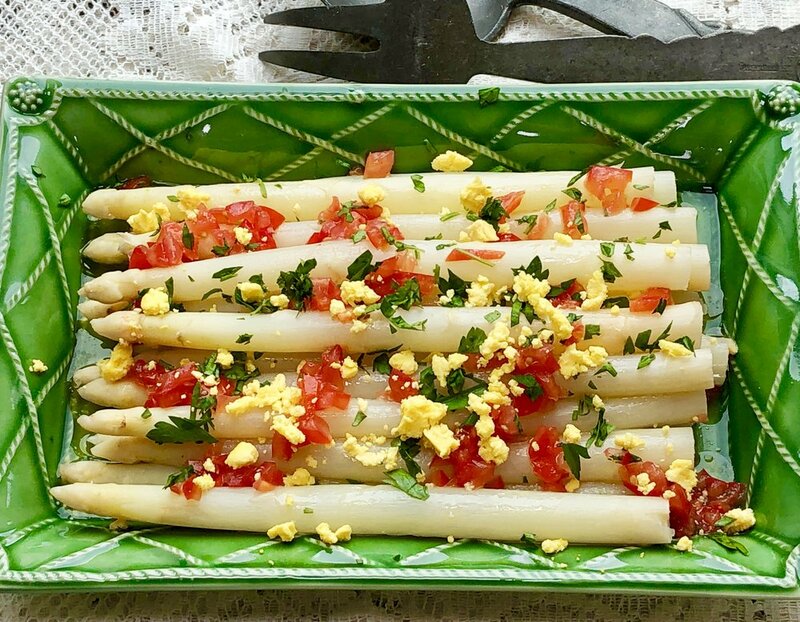 If you’re lucky enough to be able to buy white asparagus, keep the preparation simple. You can eat the spears uncooked, sprinkled with lemon juice or dipped in some flavored mayonnaise or vinaigrette. Or steam or poach them quickly and add a sprinkle of butter or coconut oil. Eat these hot or cold. When in need of a quick, festive side dish, think asparagus. They’re elegant looking and there’s very little you have to do to them. Only the real fat ones need peeling. Wash them off, cut off the fibrous, purplish-white ends and cook them. Either steam, poach or roast them. It takes just minutes, depending on thickness. Here’s one of my favorites, to be served tonight with my pre-fast dinner.